These figures can be made into 2 sets or 3 sets. Some figures/heads can be mixed and matched for diversification. Max sprue size = 15 impressions. Regular sprue size = 12 impressions. Smaller sprues size = 10 impressions. Let me start by saying these look great, and I am just itching to get me a big plastic pile of these! As for sets, I like the MAC format for armies like this. Set 1: Figures 1-3, four impressions of each, swapping heads for some of the impressions with figures 5 and 9 for added variety. Set 2: Figures 4-12, with duplicates of 5, 6, and 10. Before I go into the details of boxes, may I suggest to try to add a fifer in the command box. Indeed American companies did have a drummer and a fifer which makes them quite characteristic. 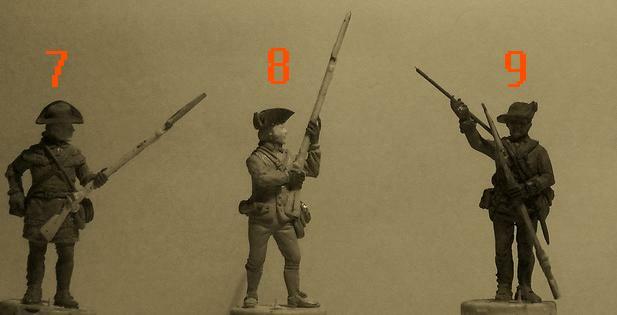 For the foot officer with the pike, the design of the pike should more simple as the one portrayed looks more pike a European seven years wars equivalent. Heads swap: this is really an area where you can make the difference and create the ultimate AWI sets. You should have enough round hats, round/left side up hats and cocked hats as these will also benefit the British infantry and the future sets of artillery and cavalry. AWI is unique in the fact the units were nearly all different in their look especially starting with headgear. I will study more the poses and come back later. Assuming most people opt for MAC sets. Fill a box with marching figures, and another with command figures. For a standard 12 figure sprue I would lose No.11 and duplicate No. 's 5,6,9,& 10. Perhaps the duplicates could have cocked hats instead of round hats. If you went for a 15 figure sprue you could include No.11 and duplicate No. 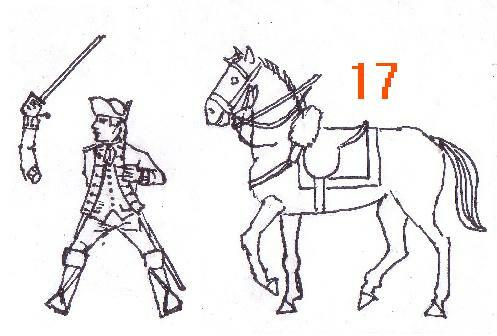 's 7,& 12 or perhaps 7,& 4. For once I would not support the MAC format as one box should make it without the command figures if we aim at a 56-60 fig like the Nap French carabiniers we could move faster. If we go to a format like Nassau infantry well even better as we can include 2 full command sprues and then have them ready sooner. The key is to get additional headgear at least like for the British peninsular infantry. Fife and drums do not include these into their products for these reasons. Maybe someone can confirm or deny this. Fig 12 has a headgear that is accurate but that could be made by cutting a round hat or a cocked hat so I would change It. I am still thinking about this great opportunity after 10 Years of looking at the masters. These look great - I would certainly invest in these no matter what format you go for (as long as they don't have any bits to stick on) - Thank you I look forward to their appearance at my local retailer! Agree about the addition of a fifer, can't believe I didn't think of that. This is excellent news. I appreciate this will take a long time to come into fruition but I'm pleased to see they've made the next stage of discussing poses/combinations. I would agree with CPN about doing it in larger box format rather than MAC. Unlike the Nap Wars, the battles involved smaller numbers of forces and especially from the British perspective, was often not whole battalions/regiments getting involved but mixes of several small units forming together to make up a battalion sized unit. Grenadiers and light infantry were often separated from their regiments and combined together. Therefore, I think there is less need for the quantity of standard bearers and musicians that Nap sets require. A variety of headgear would be really great as well-uniform standards on both sides were very mixed and units did ditch their tricornes for round hats and other alternatives. 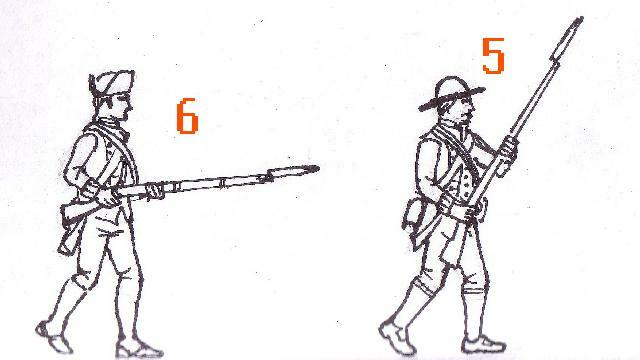 For the continentals a high number of loading/firing poses is great-numbers 7, 8, 9, 10, 12 all look very good. I would suggest that a kneeling firing pose would be good. 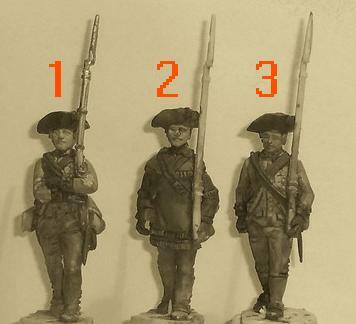 Sizing wise should match the Accurate British/militia sets. I'm sure with more time to think I'll bore everyone with more of my thoughts on this! Marching, Action, Command has been a great success, at least from this gamer's point of view. I prefer to have the option to build my forces with a majority of marching figures, as they work better (in my experience) for gaming, and are easier to store. If you wanted to overload the Action set with firing figures ,I'd have no objection whatsoever to that. I don't think kneeling figures work for Americans. The Von Steuben drill did not call for it as I recall. Earlier drill like Bland's perhaps, but I did not think it was common. (can't footnote that though so would defer to a more informed reader). And what about their British opponents? I would prefer they were the first ones to be released. I remember the pictures of the masters and they were great figures, specially the Comman group. 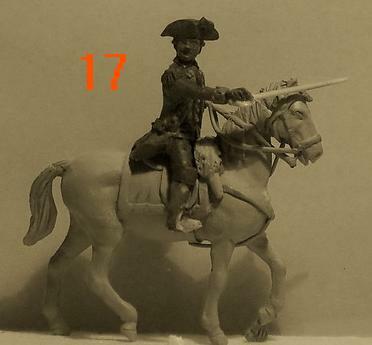 So excited about these figures - the first decent set issued in 1/72 plastic since Accurate/Revell so many moons ago. I definitely plan to buy these on a massive scale to "buck up" my current Continentals. 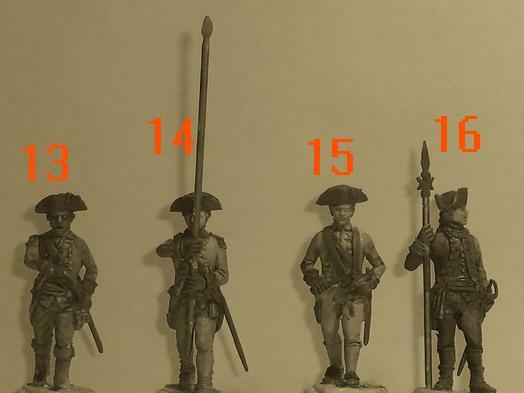 For decades I've pretty much been forced to use Accurate British Regulars painted as Continentals as most American sets have leaned toward militia. I do not include an unfortunate attempt by another company the effort was well intended but scale-wise. As far as their British opponents are concerned, I have seen the masters for them and they are equally superb - I have no doubt they are on their way. I think HaT is taking it easy on us - how much joy can we take in one bite? "When ordered to march, he must not charge himself with any unnecessary baggage; he will march at his ease, without however leaving his rank or file; he should drink as seldom as possible, and never stop but when necessity obliges him; in which case he must ask leave of the commanding officer of the platoon." 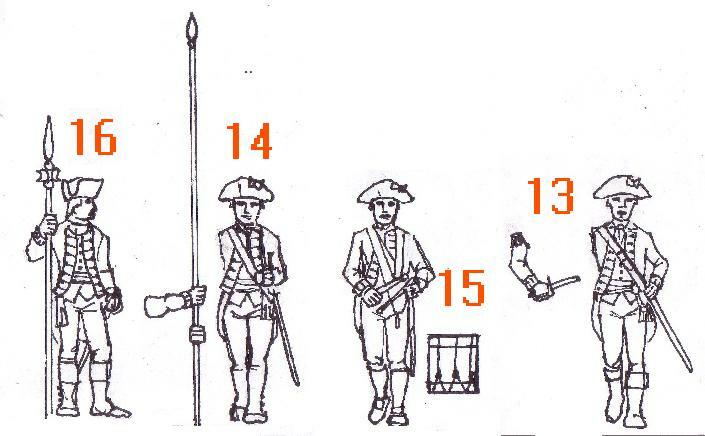 I would imagine the figure in pose 1 would be marching "At Ease March." We still had that command for long marches when I was in, with us it was at sling arms or port at our own step. Thank for this precision of which I was unsure probably because I was focusing too much on the battle side of the topic. I second your request that if HAT can , to develop a British infantry in the same time. I think this it's a good idea. Any particular format is fine with me. I got into miniatures largely because of the bicentennial sets that came out here in the states. It's coming up on fifty years later and these figures would really fit the bill for an old hobbyist. I don't think kneeling figures work for Americans. The Von Steuben drill did not call for it as I recall. Earlier drill like Bland's perhaps, but I did not think it was common. (can't footnote that though so would defer to a more informed reader). You are correct, it is not in von Steuben, neither is it in the 1764 exercise, for the very simple reason that this tiring position simply wasn't necessary since the two rank firing line had been adopted by both sides. 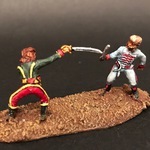 Kneeling figures crabbing about the table are a curse of the wargaming classes!